Last year I traveled to Costa Rica to take part in a Horse and Soul workshop at the fabulous Leaves and Lizards Arenal Volcano Retreat. I was blessed to be able to return again this year and work with a horse name Titan. Here is a story about some of the amazing results that can happen with these horses during a workshop. Part of the work we did this particular day was exploring the many different roles the horses display and embody as part of the herd. Roles like nurturer/companion, sentinel, dominant and leader. 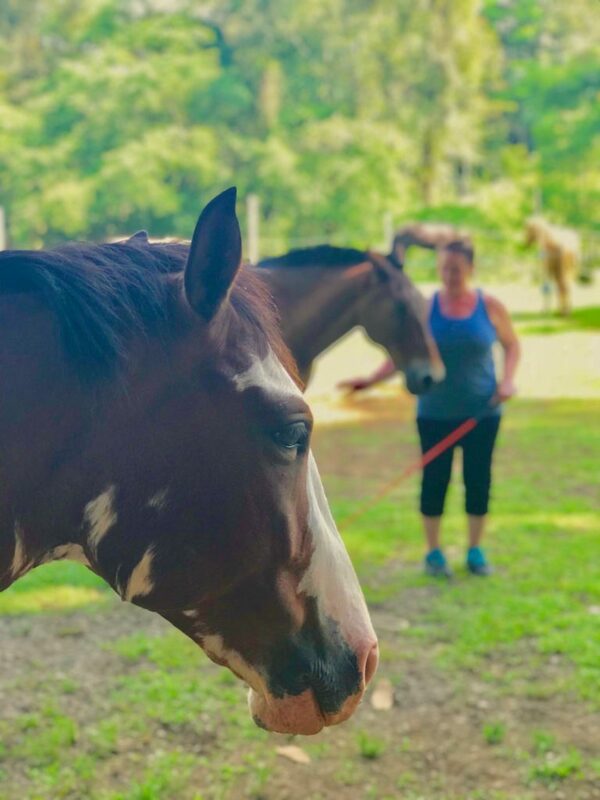 The horses know just how to flow and move in and out of these roles and they were teaching us how to embody healthy balanced versions of these roles. The hardest role for me to step into was the dominant role. This is not surprising because most of us have never seen this role demonstrated in a healthy and balanced way. We are usually familiar with people that are displaying this role in an overemphasized way and actually moving into a predatory type of energy. The horses have a way of showing us what it looks like to step into this role in a way that feels good for both the giver and receiver. I got to witness one of the workshop instructors demonstrate this with my horse and I could see that both of them were having great time playing with this role. It was a beautifully presented lesson on the give and take energy that can create a bond of trust and respect when done with the right intention. Now it was my turn to work with Titan and explore taking on the role of dominant energy. At first it was not going well, he was calling the shots and I was letting him. I realized I was much more comfortable with nurturer/companion role and it was my safety zone of operations. If I couldn’t get what I wanted through that role I would often give up and give in, versus moving into any other role. But Titan was having none of that – he made it clear he trusted me and that I should trust myself. I started to see that not only was he supporting me through exploring this energy, he was enjoying it and wanted me to play with him. It was an epiphany when our instructor explained to me that a display of dominance is part of how horses play with each other and practice this role for when they need to utilize it. After I made the mental switch to realizing that I wasn’t hurting him or being unkind to him, I finally was able to allow myself to fully step into this energy. Titan responded with the behavior and energy of enthusiasm and most importantly I felt like we were connected and in sync in a way that I previously had not felt. It was truly amazing to feel the embodiment of that energy. My takeaway from this encounter is that there is value, depth and richness in being able to move in and out of these different roles as needed. When we get stuck operating out of only one of these roles our lives feel unbalanced – and often our relationships and sense of satisfaction with our life will reflect this imbalance. The horses were demonstrating for all of us that there is a time and a place for stepping into each of these roles. Behind the willingness to explore these energies we will find more balance, empowerment and most of all more joy. This was only day two of our 8 day workshop, so stay tuned for more illuminating lessons from the horses!